abaolux Polarized Sports Sunglasses, 5 Interchangeable Lenses, TR-90 Frame, for Men and Women. 1）. Hold one end of the lenses, slightly pull out the frame of that side to take out lens; Repeat at the other end. 2）. Gently push the middle part and slide the lens out of the groove. 3).The detachable myopia frame have no lenses.You can take it to the myopia glasses shop and get the right lenses for you.But if you are not near-sighted you can remove it easily. 1）. Slide the middle part into the V-shaped groove, but don't need to push the lens firmly into position yet. 2）. Slightly pull out of the frame at one side and put one end of lenses in; Repeat at the other end. 3）. Check both middle and sides are assembled correctly, then push down the top of the lenses along the frame line to make sure the lenses are well clicked-in. 1）. Although the frame is very difficult to break, it is a better idea not to pull it out too hard to cause deformation. 2）. The thicknesses of different lenses ae different, it might take some practices to fluently remove and install all lenses. 6）. Never leave your sunglasses under car's front window, especially in summer. Prolonged exposure to the oven-like temperatures inside a car can degrade the lens. 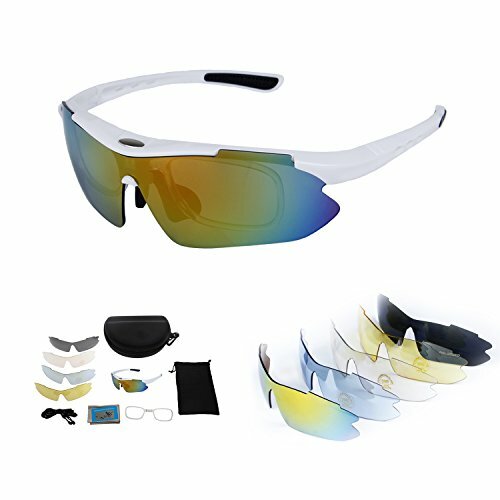 4 MORE INTERCHANGEABLE LENSES for Sport Glasses: Beside main polarization lens, we also provide 4 more lenses (Mirrored, yellow night vision, blue, clear anti-fog) to get you prepared for all conditions. The Main one is colourful lense ,the yellow one is for night activities,the balck one is polarized for driving and other activities.We have relevant recommendations to report that all the lens 100% UV400 protection coating, blocks 100% harmful UVA & UVB Rays. UV 400 MIRROR FLASH COATING - 100% UV400 protection meaning it can block 99%-100% of both UVA and UVB harmful radiation. It is essential to protecting your eyes against all the rays below 400NM harm when go out running, cycling, hiking, climbing, baseball, driving. Extremely Light & Unbreakable: The frame is made of TR90, a polymer material with a memory that is extremely light and super flexible. If you have any questions about this product by abaolux, contact us by completing and submitting the form below. If you are looking for a specif part number, please include it with your message.